Selecting the right mobility product may be new to you, something you've never done. 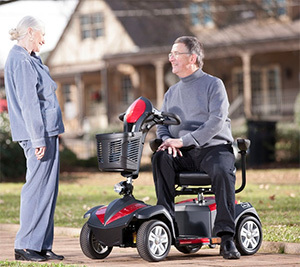 With the right advice, finding the mobility device or medical product for your specific needs can be simple. Knowing which options best address your needs will give you confidence in your decisions and satisfaction in the products you choose. Whether you are exploring products for yourself or a loved one, SpinLife University is here to help. Below you'll find articles that can help you decide which product is right for you or your loved one. SpinLife will also be here down the road if you need information about how to maintain your equipment and to answer any questions you might have along the way. So explore our knowledge base and if you need further advice, feel free to call our Product Experts at 1-800-850-0335. Mobility scooters are a great option for someone who needs help getting around. The articles below will review some of key topics you might consider when choosing a mobility scooter. Which Type of Mobility Device is Right for Me? Traditional wheelchairs are a simple cost effective option. The right size, fit, and weight of a wheelchair can significantly impact how useful and comfortable an individual chair can be. Check out the articles below for more details. Power wheelchairs enhance the mobility and independence of people worldwide. Below are some easy guides to help you choose the right power wheelchair to meet your individual needs. Lift Chairs are a great solution for someone who needs assistance standing from a seated position. Lift chairs come in different sizes and models so it's important to find the right chair for your needs. Some chairs even can have therapeutic features added, such as heat and massage. SpinLife has a great selection of Home Care products that can make life at home easier. These products include Patient Lifts, Beds and Bathing assistance. The articles below can help you choose which products would make getting around your home easier. Your mobility equipment lets you get out and see the world. The product you use to take your scooter or power wheelchair with you is an important decision. Our Experts explain the different transport and accessibility options in these articles.